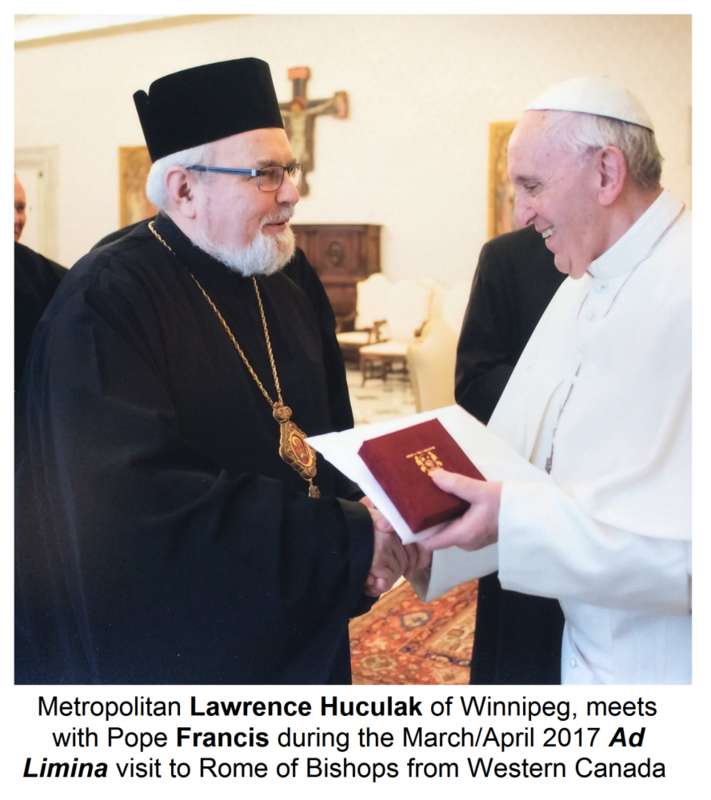 Metropolitan Lawrence Huculak, the Archbishop of Winnipeg, and three other Ukrainian Catholic Bishops, joined all the Catholic Bishops from across Western Canada for a visit to the Vatican for this year's Ad Limina visit. 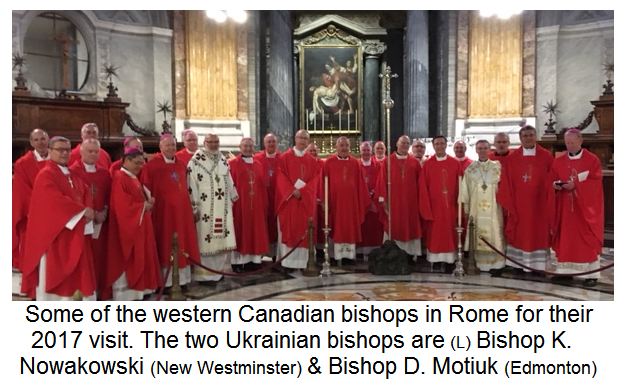 The other Ukrainian Bishops were Bishop Bryan Bayda of Saskatoon, Bishop David Motiuk of Edmonton and Bishop Kenneth Nowakowski of New Westminster (BC). Among the Roman Catholic Bishops that accompanied them were Archbishop Richard Gagnon of Winnipeg and Archbishop Albert Legatt of St. Boniface. Why did they all go to Rome? Well. It is a long-time practice that every active bishop makes a pilgrimage to Rome every five years. During this pilgrimage, they visit the tombs of the Chief-of-the-Apostles (Первоверховні Апостоли) Sts. Peter and Paul and they report to various dicasteries (departments) of the Vatican administration known as the Roman Curia. One of the high points of this trip is an audience with the Holy Father Pope Francis. At one time the Pope met every single Bishop for a private audience, but Pope Francis has decided to only meet them all together for a general meeting during which they may share ideas and comments together and perhaps greet the Pope with a handshake and a kiss of peace. They did, however, meet with him for over two and a half hours! The Bishops divided up the reports that they were to give to each of the dicasteries and took turns delivering the report on behalf of the Catholic Church in Western Canada. Of course the Ukrainian Bishops took special interest in the dicastery known as the Congregation for the Eastern Churches. In spite of all these reports, every eparchy and diocese is also required to make a full report on the activity and state of life within that local “particular” church. The Bishops did a lot together. They lived at the House for Clergy only a few blocks from St. Peter’s Basilica, and they ate many of their meals together and, of course, they prayed together on many occasions. Our Metropolitan and the other Ukrainian Bishops, besides conducting interviews and visiting various Ukrainian and non-Ukrainian institutions in Rome, occasionally led the prayer for the whole group. 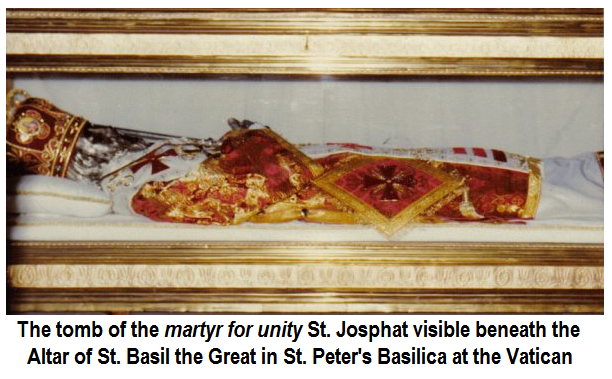 Many of the bishops agreed that one of the spiritual highlights was the concelebrated Divine Liturgy of St. John Chrysostom in St. Peter’s Basilica at the tomb of the holy Hieromartyr St. Josaphat. We look forward to a summary report from Metropolitan when he returns to Winnipeg. Metropolitan Lawrence naturally led the delegation of the Assembly of Western Catholic Bishops to the abovementioned Eastern Congregation. During his opening remarks to the Prefect of the dicastery, Cardinal Leonardo Sandri, the Metropolitan Lawrence spoke of the 12 Eastern Catholic Bishops that provide pastoral leadership for the various Eastern Catholics living in Western Canada. Ukrainian Catholics make up the largest number and have four bishops with eparchial sees in the area. However, there are many more that presently have their bishop residing in Eastern Canada or, in some cases, in the United States, but these bishops still visit and oversee life in their parishes throughout the west. He also spoke about the extraordinary positive spirit of collaboration between Eastern Catholic and Western Catholic clergy and faithful that has developed in western Canada. This is evident as well in relations with non-Catholic Churches. Metropolitan Lawrence also mentioned the establishment 100 years ago of the Pontifical Oriental Institute by Pope Benedict XV in 1917. This institute for Eastern Christian studies was established to be a place that would assure the whole Church that Eastern Christian theology, canon law, history, spirituality and ecclesiology would not only be preserved, but that it would thrive and develop. A number of the clergy now serving within the Archeparchy of Winnipeg - including the Metropolitan who achived a doctorate in liturgical research - studied at the Pontifical Oriental Institute at one time or another in one of the fields of specialization mentioned above. (Vatican Radio) Pope Francis met this week with the members of the Assembly of Western Catholic Bishops (AWCB) of Canada, who are in Rome for their regular ad limina visits. Ukrainian Catholic Bishops David Motiuk, of the Eparchy of Edmonton, and Ken Nowakowski, of New Westminster, came to Vatican Radio where they spoke with Christopher Wells about their meeting with the Pope. “I think it was very much a time of listening to each other,” Bishop Nowakowski added. Pope Francis, he said, told the group “Being a bishop is hard,” and said he appreciates the work the Bishops are doing. Nowakowski said the Holy Father emphasized the need for Bishops to be close to their people, and the importance of solidarity: “being in a close relationship with our faithful, with our parish priests, with the Bishops, and with the Holy Father.” It’s a concept, the Bishop said, that the Eastern Catholic Churches understand well.